Online auction site eBay has agreed to buy internet telephone company Skype Technologies in a $2.6bn (£1.4bn) deal. EBay said it would pay half the amount in cash and the other half in stocks to create "an unparalleled e-commerce and communications engine". Skype's software lets PC users talk to each other for free and make cut-price calls to mobiles and landlines. Other players in the online phone market include computer giants such as Google, Microsoft, AOL and Yahoo. Google recently launched its Talk service, while Microsoft purchased leading player Teleo for an undisclosed sum. Technology used by Skype, and rivals such as Vonage, converts phone conversations into packets of data and transmits them down the same wires used to surf the internet. If certain performance targets are met, eBay said it would pay an additional $1.5bn to Skype over the next three years , bringing the total size of the deal to $4bn. "Communications is at the heart of e-commerce and community," said eBay chief executive Meg Whitman. Using Voice over Internet Protocol (VoIP) services, computer users can talk to each other via a headset or microphone and speakers. Cheap calls to landlines and mobile phones are also possible. Some systems allow users to plug their traditional phones into a desktop box that allows them to make VoIP calls. 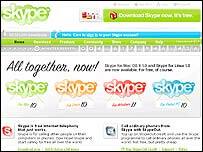 Skype has 53 million registered users and says more than two million people are using its software at any given moment. Since it was introduced in 2003, the free program has been downloaded more than 151 million times. The company does not release earnings figures. Vonage, the largest internet phone company, has nearly one million subscribers who pay a monthly fee of $25 to use it. EBay has been buying up firms - including payment system PayPal - in an effort to increase the number of services it offers to consumers and keep its profits growing. 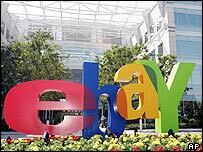 Media reports have speculated that as well as looking to tap into the growing internet phone market, eBay is also attracted by the idea of letting its buyers and sellers talk to each other via their computers.